Frank Castorf might have been born to direct From the House of the Dead. In this, his third opera project – or better, his third opera project in the opera house, for his Volksbühne Meistersinger must surely be reckoned with, even by those of us who did not see it – many of his hallmarks and those of his team are present, yet without the slightest hint of staleness, of anything other than being reborn for and in the work. And how the work suits such an approach; in many respects, the deconstruction has already been done. Probably Janáček’s greatest opera, indeed his greatest work of all, it is no accident that it is the one Pierre Boulez chose to conduct, towards the end of his life. Alas I never heard that live, although in 2014, I would see Patrice Chéreau’s production in Berlin. That was, of course, a fine piece of theatre, as indeed was Krzysztof Warlikowski’s Covent Garden staging, seen earlier this year. Castorf, however, revelling in its fragmentary nature – for it is in many respects his own – triumphantly, I should say dialectically, offers the strongest sense of a whole I have seen or could imagine. 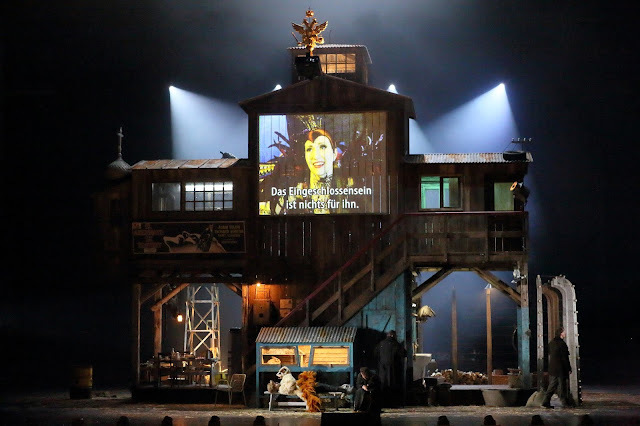 By taking it as it is, Castorf’s team and a magnificent cast, aided greatly by Bavarian State Opera forces under Simone Young in the finest performance I have heard from her, alert both to the needs of the minute and of the greater architecture, present and represent the opera as it is and might be. Quite without sentimentality, they write and rewrite, igniting and reigniting that Dostoevskian redemptive spark that is both present and absent throughout, depending when and where one looks and listens, how and with what one pieces together one’s own narrative, musical and dramatic. We are in Russia – no doubt of that. It is Russia at a dark time – again no doubt of that. (When, however, was that not the case, save for a few years under Lenin, and even then…?) But is it a ‘real’ Russia? And what indeed could so impossibly naïve a formulation mean? Live camerawork performs all manner of tasks, questioning our ability to comprehend, to view, to narrate, whilst making it all the more necessary that we try to do so. There is little doubt concerning the realism – until, that is, a true Carnival of the Dead comes amongst the prisoners and the prison. Magic realism? Perhaps, but if so, it is the blackest of magic to follow, perhaps even to sublate, the blackest of comedy and (non-)redemption. Whereas, in his Siegfried and Gotterdammerung, Castorf took us to an alternative historical path for the GDR, an alternative that turned out not to be so very alternative at all, (Al)Exander Platz still a commercial, post-socialist wasteland, Wall Street still failing to burn, here we seem perhaps to have joined the USSR for an alternative 1930s. Or have we? Trotskyist hints abound: the rabbit hutch (many thanks to my friend Sam Goodyear for having pointed out the connection), Mexico too (‘Partido liberal’, we read on one of many historical and/or imaginary signs), a film advertisement (in Spanish), starring Alain Delon. (Hang on, if we are in 1972…?) Even a carnival bird Aljeja, splendidly sung by Evgeniya Sotnikova, seems both to suggest and to disavow that possibility. Or are we, was I, confusing him/her – here most definitely ‘her’ – with the Prisoner with the Eagle, or his eagle? What might that mean here, whether the confusion or the eagle? Russia or the USSR, however, it certainly remains, even down to the affinity – which seems to have been overstated by some – with Aleksandar Denić’s Walküre set (Azerbaijan, 1942). What does a sign for Pepsi Cola in English and Russian tell us? And what, at the end, does the English poster invitation to travel to the USSR as a holiday destination mean, not least in such appalling circumstances? Stop trying to ascribe meaning to everything: is that not what, as an imprisoned intellectual, one is compelled to do? Are we to see the future and will it to work, or perhaps indict it? Is it just a joke, as suggested by the presence of a Ring crocodile? Who knows? We shall never make the journey, just like so many of those prisoners, yet unlike, perhaps, Gorjančikov, who thinks he has something written in his head. Like Dostoevsky, like Trotsky, like Castorf, like our writer, Alexandr Petrovič Gorjančikov, we write and rewrite. So too does the action all around, on stage, on film, seen and unseen; so too, of course, does the orchestra. It is complicated, yes; how can a fragmentary drama with so many ‘characters’ or at least people not be? But it is also visceral, direct. Violence we see, we feel, whether we like it or not, be it in the Guard’s sadistic flagellation (a truly nasty Long Long, almost a match for the still nastier Governor of Christian Rieger) or in the metal of the steppes’ orchestra. 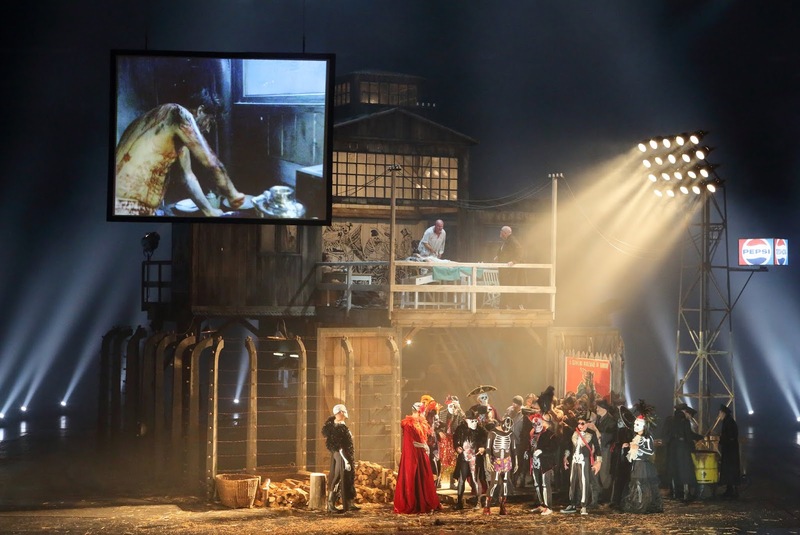 Opera too, even in this most inhospitable of circumstances, is reborn. If the Wanderer seemed to have been an inspiration for our noble prisoner’s initial journey to this camp, Peter Mikuláš capturing both intelligence and a certain camouflaged nobility, then it is the Wotan of the second-act Walküre monologue who comes to mind in that of Šiškov. 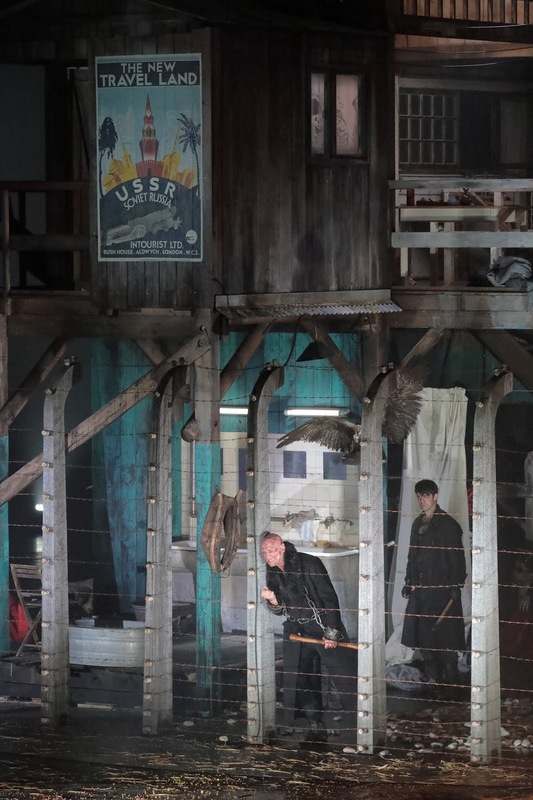 That is partly a matter of Bo Skovhus’s searing portrayal, quite the most powerful performance I have seen and heard from him in a long time. But everyone involved has played a role in putting these pieces together, in constructing something from these musico-dramatic shards. ‘A mother gave birth even to Filka,’ after all – and we know it, because, like Šiškov, he sings, not least in this devilish incarnation from Aleš Briscein. 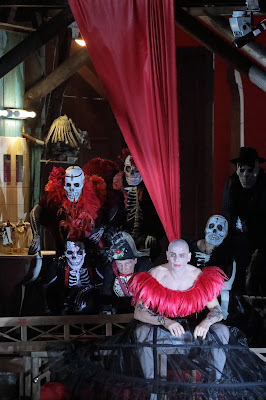 So too, earlier, do Don Juan (an outstanding Callum Thorpe) and his pseudo-Leporello (another excellent performance, this time from Matthew Grills), in a play-within-a-play. That, thanks to Castorf’s lengthy experience with and rejuvenation of post-dramatic commentary, seems more of a play-in-itself than I can recall – until, once again, it does not. For, like Don Giovanni, this is redemptive within and without, or seems to be: as I said, it takes life and drama as they are. A (post-)religious consciousness is at work here. It also, perhaps, suggests what they might be, or at least what one day, when the revolution comes again, the revolution to which we cling no matter what, we might hope it to be. The noble prisoner leaves, though, so most likely not. He has used, learned from his experience; so, we imagine, have we. The carnival of (Russian) death continues. There is a chink of something uncertain. In the blackest of comedies, we might even think it light. Humanity even – though are we not all now post-human(ist) as well as post-dramatic? Who knows, who cares? 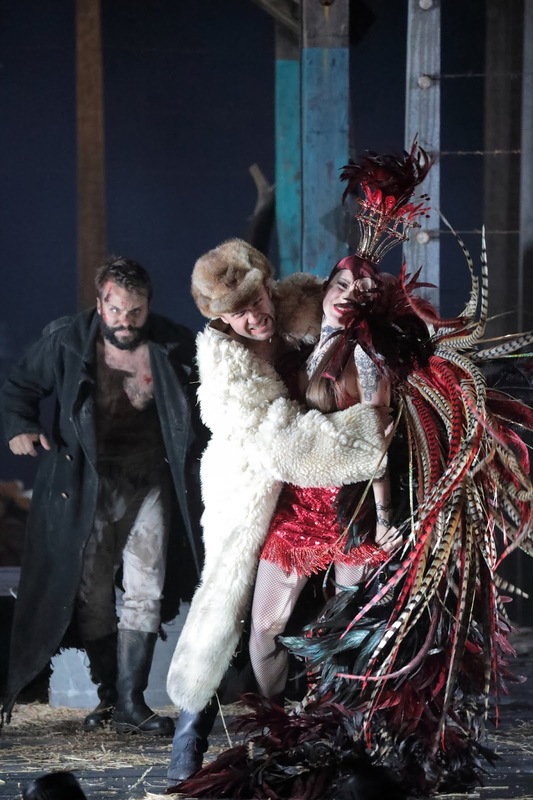 This human comedy and tragedy of which we are part rolls on, just as it did for those Calderón-like figures of a reimagined Salzburg World Theatre in the celebrated post-war Furtwängler Don Giovanni. The final scene alienates – like Mozart’s. And yet, like that too, it moves (us). We have experienced something, even if we have not a hope in our living hell of learning what it may have been. We have, like this Gorjančikov, written a work of sorts in our head. No one will read it or even remember it, perhaps it would be impossible for anyone to make sense of its difficult, even nonsensical fragments; yet that spark of creativity, of art, of that which Marx just as much as Schiller considered made us human, has flickered. At least we think it did. Perhaps. Or at least we thought it did. Once. Perhaps. 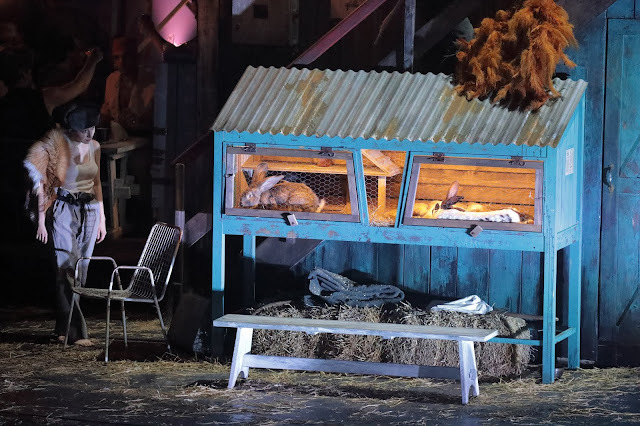 We return, like Gorjančikov, like Trotsky, to watch the post/non-human (non-)drama for the rabbits in their hutch, caged like us and yet (to the sentimental?) more free. Perhaps.